This story was written by Joby Warrick. Intelligence provided to U.N. nuclear officials shows that Iran's government has mastered the critical steps needed to build a nuclear weapon, receiving assistance from foreign scientists to overcome key technical hurdles, according to Western diplomats and nuclear experts briefed on the findings. The officials, citing secret intelligence provided over several years to the International Atomic Energy Agency, said the records reinforce concerns that Iran continued to conduct weapons-related research after 2003 -- when, U.S. intelligence agencies believe, Iranian leaders halted such experiments in response to international and domestic pressures. The U.N. nuclear watchdog is due to release a report this week laying out its findings on Iran's efforts to obtain sensitive nuclear technology. Fears that Iran could quickly build an atomic bomb, if it chooses to, have fueled anti-Iran rhetoric and new threats of military strikes. Some U.S. arms-control groups have cautioned against what they fear could be an overreaction to the report, saying there is still time to persuade Iran to change its behavior. Iranian officials expressed indifference about the report. "Let them publish and see what happens," said Iran's foreign minister and former nuclear top official, Ali Akbar Salehi, the semiofficial Mehr News Agency reported Saturday. Salehi said that the controversy over Iran's nuclear program is "100 percent political" and that the IAEA is "under pressure from foreign powers." Although the IAEA has chided Iran for years to come clean about a number of apparently weapons-related scientific projects, the new disclosures fill out the contours of an apparent secret research program that was more ambitious, more organized and more successful than commonly suspected. Beginning early in the last decade and apparently resuming -- though at a more measured pace -- after a pause in 2003, Iranian scientists worked concurrently across multiple disciplines to obtain key skills needed to make and test a nuclear weapon that could fit inside the country's long-range missiles, said David Albright, a former IAEA official who has reviewed the intelligence files. "The program never really stopped," said Albright, president of the Washington-based Institute for Science and International Security. The institute performs widely respected independent analyses of nuclear programs in countries around the world, often drawing from IAEA data. "After 2003, money was made available for research in areas that sure look like nuclear weapons work but were hidden within civilian institutions," Albright said. U.S. intelligence officials maintain that Iran's leaders have not decided whether to build nuclear weapons but are intent on gathering all the components and skills so they can quickly assemble a bomb if they choose to. 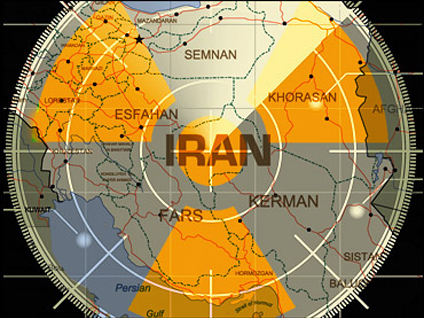 Iran has consistently maintained that its nuclear activities are peaceful and intended only to generate electricity. The IAEA has declined to comment on the intelligence it has received from member states, including the United States, pending the release of its report. But some of the highlights were described in a presentation by Albright at a private conference of intelligence professionals last week. PowerPoint slides from the presentation were obtained by The Washington Post, and details of Albright's summary were confirmed by two European diplomats privy to the IAEA's internal reports. The two officials spoke on the condition of anonymity, in keeping with diplomatic protocol. Albright said IAEA officials, based on the totality of the evidence given to them, have concluded that Iran "has sufficient information to design and produce a workable implosion nuclear device" using highly enriched uranium as its fissile core. In the presentation, he described intelligence that points to a formalized and rigorous process for gaining all the necessary skills for weapons-building, using native talent as well as a generous helping of foreign expertise. "The [intelligence] points to a comprehensive project structure and hierarchy with clear responsibilities, timelines and deliverables," Albright said, according to the notes from the presentation. According to Albright, one key breakthrough that has not been publicly described was Iran's success in obtaining design information for a device known as an R265 generator. The device is a hemispherical aluminum shell with an intricate array of high explosives that detonate with split-second precision. These charges compress a small sphere of enriched uranium or plutonium to trigger a nuclear chain reaction. Creating such a device is a formidable technical challenge, and Iran needed outside assistance in designing the generator and testing its performance, Albright said. According to the intelligence provided to the IAEA, key assistance in both areas was provided by Vyacheslav Danilenko, a former Soviet nuclear scientist who was contracted in the mid-1990s by Iran's Physics Research Center, a facility linked to the country's nuclear program. Documents provided to the U.N. officials showed that Danilenko offered assistance to the Iranians over at least five years, giving lectures and sharing research papers on developing and testing an explosives package that the Iranians apparently incorporated into their warhead design, according to two officials with access to the IAEA's confidential files. Danilenko's role was judged to be so critical that IAEA investigators devoted considerable effort to obtaining his cooperation, the two officials said. The scientist acknowledged his role but said he thought his work was limited to assisting civilian engineering projects, the sources said. There is no evidence that Russian government officials knew of Danilenko's activities in Iran. ¬E-mails requesting comment from Russian officials in Washington and Moscow were not returned. Efforts to reach Danilenko through his former company were not successful. Iran relied on foreign experts to supply mathematical formulas and codes for theoretical design work -- some of which appear to have originated in North Korea, diplomats and weapons experts say. Additional help appears to have come from the father of Pakistan's nuclear program, Abdul Qadeer Khan, whose design for a device known as a neutron initiator was found in Iran, the sources said. Khan is known to have provided nuclear blueprints to Libya that included a neutron initiator, a device that shoots a stream of atomic particles into a nuclear weapon's fissile core at the start of the nuclear chain reaction. One Iranian document provided to the IAEA portrayed Iranian scientists as discussing plans to conduct a four-year study of neutron initiators beginning in 2007, four years after Iran was said to have halted such research. "It is unknown if it commenced or progressed as planned," Albright said. The disclosures come against a backdrop of new threats of military strikes on Iran. Israeli newspapers reported last week that there is high-level government support in Israel for a military attack on Iran's nuclear installations. "One of the problems with such open threats of military action is that it furthers the drift towards a military conflict and makes it more difficult to dial down tensions," said Peter Crail, a nonproliferation analyst with the Arms Control Association, a Washington advocacy group. "It also risks creating an assumption that we can always end Iran's nuclear program with a few airstrikes if nothing else works. That's simply not the case." Special correspondent Thomas Erdbrink in Tehran contributed to this report. The Washington Post. All rights reserved.